There are 67 Sports web directory related resources in this category! Sport news taking place in England: interviews, videos, commentaries and more. Offers top headlines, but you can also create an account and customize your headlines. You can pick between teams, sports, specific players, and even news writers to get headlines and stories. Top headlines and read from Yahoo sports experts. Featured videos and blogs can be found, also. Website dedicated to cheerleading. Focuses on cheer training, fundraising, competitions and more. Includes message boards, stunts, cheer buzz and news. Website dedicated to racers, but also addressing recreational mobilers. Offers organization links and travel guide. Information on your fantasy teams, real sports teams, players, and breaking news. A scoreboard shows the scores of games currently in progress. Portal dedicated to professionals who own, operate or are building sports, recreation and fitness facilities. Action sports resource that offers access to videos, blogs, news and details about sports related event. Users can even upload their own videos. Open source sports network where fans can write articles, rankings, picks, rumors, and analysis on their favorite sports including MLB, NFL, College Football and NBA. Online sports social network provides a daily snapshot of the sports world. Includes fresh daily updates of sports news, rumors, and videos submitted by fans. Spotlights Canadian sports, but does not limit their news to only Canada. They also heavily cover American sports like the National Football League, and Major League Baseball. Provides complete coverage of sports from Canada and around the world includes team standings, stats, video highlights and photos. Official CBS sport section offering news and live scores from NBA, NHC, NFL and NCAA. All surrounding reporting of sports, college, high school, professional, or fantasy. Contains detailed data about teams, clubs, line-ups and offers links to supporters forums and more. 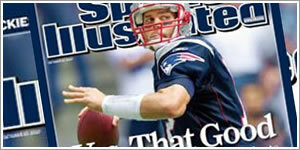 Presents full coverage of the NFL, MLB, NBA, NHL, college football and basketball, NASCAR and more. Users can play fantasy sports, catch video highlights, and get all the scores and news for your favorite teams and players. Articles on opinions of headlining news, or chat with other sports fanatics about current sport events. Monitoring the sports entertainment niche on an international scale. Offering sports news and rumors without access, favor or discretion. Offers comprehensive sports calendars. Requires online registration, after which users can make and add their home pages. Offers the latest sports news, scores, statistics, news, injury reports, schedules and team information for NBA, NHL, NFL, MLB, ATP and other sports. Offers the latest scores, statistics and news in real time. Users are invited to use the searchable index, exclusive feature stories and fan-mail. Offers access to historical research and statistical services in the field of professional sports. Website where sports fans can read the latest ESPN coverage scores, and news headlines for all professional and college sports. Includes fantasy leagues, games and chat rooms. Offers live soccer scores and results for over 100 soccer leagues, cups and tournaments. Also lists scores and results for hockey, tennis, basketball and other sports. Featuring sports scores, in-depth player and team news, videos, schedules, fantasy games and more. Website provides live scores, player and team news, rumors, stats, schedules, standings, and fantasy sports for sports leagues including the NFL, MLB, NBA, NASCAR and NHL. Provides detailed and live sports scores, stats, league tables, fixtures, news, and commentaries. Covers football, soccer, tennis, rugby, ice hockey and more. Provides both live and on-demand coverage of domestic and international figure skating competitions. Also offers skater profiles, photos and a video archive. Australian sports magazine that features local and international sportsmodels, pictorials, humour and competitions. Offers trivia, prediction contests, real-time bulletin board and other news about sports and famed athletes of the moment. Offers news and information about the evolution of gymnastics. Covering the world of gymnastics since 1956. People that follow sports want their updates quick and they want their updates to be accurate. Sports websites are some of the most dynamic websites on any web directory, and that is because sports fans want the score of their favorite team's game immediately. The Internet is well known for bringing information to anyone anywhere in the world at any time, and the Internet can bring that information in real time. Today it is expected of every sports website that their scoring information is updated in real time, and if it is not then that website may not rank very high on any web directory. The Internet has set the level of expectation very high on up-to-date information, and any sports website that cannot deliver that information may find themselves without an audience. There is so much riding on up-to-date sports information that it is no wonder that sports fans demand a lot from their websites. The Internet has caused the fantasy sports leagues to become extremely popular, and with fantasy sports leagues comes the desperate need for up-to-date information on players and teams. Although there are many ways for the sports fans to be informed regarding the last sports news and transfers for instance, the best way of finding the information that they need is to search for a sports website inside a web directory. News reports and newspapers may be informative and accurate, but instead of waiting for the presenter to reach the information that you are interested in or instead of browsing through the pages of a newspaper, it is easier for you to type the keyword and get the info. Men are known to be addicted mainly to football, and this is why they must be aware of the precise date and location of their favourite team`s footbal match, because they would like to attend it for sure. Besides football, in the top of the most addictive sports games there are baseball, basketball and not least rugby. To sum up, the sports industry is making billions of dollars every year and this is why more and more people are becoming interested in sports. Whether you are looking to be part of a soccer team or you just want to be informed, jasminedirectory.com is a web directory that provides you all the useful information related to sports in a matter of seconds. Fantasy team owners need to know if their players are injured, how long they will be out, what teams are playing each other this week, and any information that might help to determine the outcome of those games. The fantasy sports leagues have benefited from the instant update ability of the internet, and in order to keep their audience the sports websites need to continue to provide accurate and up-to-date information. The odds makers that create the wagering parameters for sporting events also watch sports websites regularly. The need for up-to-date information is essential in sports wagering, and it is critical that a sports website offer current and accurate information if they want to keep the audience that bets their money on any of the day's sporting events.